Microsoft Excel is a powerful tool that can be used to analyse, communicate and manage information. Those with no prior spreadsheet experience will acquire expert level applied skills in the latest version of MS Excel. This instructor lead, hands-on course focuses on best practices used to create meaningful workbooks and how to master the techniques and time saving shortcuts for the daily use of MS Excel. Students learn to use MS Excel Ribbon interface with contextual tabs, Quick Access Toolbar and how to make use of templates, styles, pivot tables, what if analysis tools and macros via lectures, lab exercises and assignments outside of class. Topics include: creating, editing, formatting and saving a worksheet, sorting, filtering, slicers, applying formulae, functions, importing and exporting data, and consolidating data in multiple worksheets. This course provides preparation to write a Microsoft Office Specialist certification exam, available through third parties at additional cost. 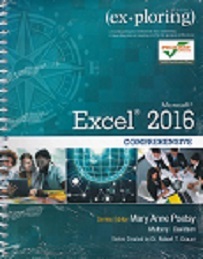 By the end of this course, successful participants will be expert end users of MS Excel. No class May 18 (Victoria Day) or June 29 (Canada Day). Use Subtotals and manage/summarize data with Pivot Tables - use of slicers. Consolidate data and 3D formulas. Analyze data using the Scenario Manager, Data Tables and Goal Seek. Apply trace dependents, precedents and trace errors options. Demonstrate finding and fixing formula errors. Prepare, create and apply Templates and Styles. Interested in being notified about future offerings of COMP 2364 - Microsoft Excel? If so, fill out the information below and we'll notify you by email when courses for each new term are displayed here.